Explanation: You may have heard of the Seven Sisters in the sky, but have you heard about the Seven Strong Men on the ground? Located just west of the Ural Mountains, the unusual Manpupuner rock formations are one of the Seven Wonders of Russia. How these ancient 40-metre high pillars formed is yet unknown. 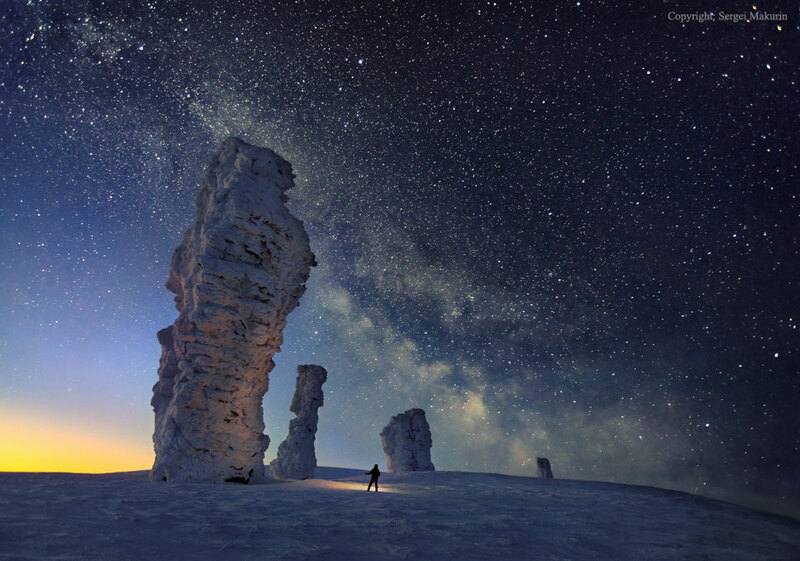 The persistent photographer of this featured image battled rough terrain and uncooperative weather to capture these rugged stone towers in winter at night, being finally successful in February of last year. Utilizing the camera's time delay feature, the photographer holds a flashlight in the foreground near one of the snow-covered pillars. High above, millions of stars shine down, while the band of our Milky Way Galaxy crosses diagonally down from the upper left.